Do you ever wait to try something? I mean deliberately postpone something, set it aside, so that it can happen at the right time, sort of leaving it to fate, for an organic experience? I take pleasure in the experience of letting some things happen in their own time, in their own way. 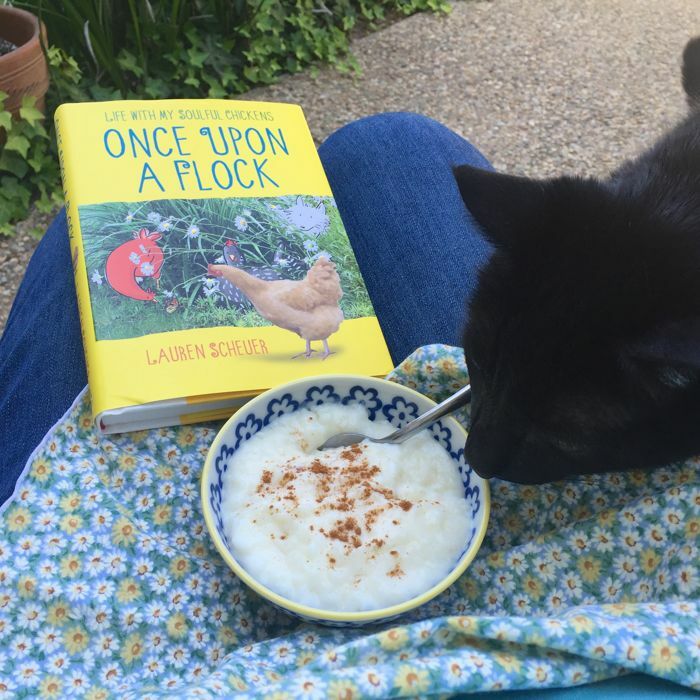 So, even though I am a chicken blogger, even though Lauren Scheuer and I are FB friends, and I adore every post, each whimsical and endearing illustration on her blog, I waited a long time before picking up her book. Once Upon a Flock arrived this week. I hugged it to my chest, and sighed, knowing I was in for a treat. Rice pudding. A beach chair at the entry, where a strong ocean breeze finds it's way to our home, Chango circling, affectionately grazing my pant leg... and a good book. It makes a pretty picture. By page sixteen, I was utterly smitten. Lauren Scheuer made something clear to me. "Because I want the experience." 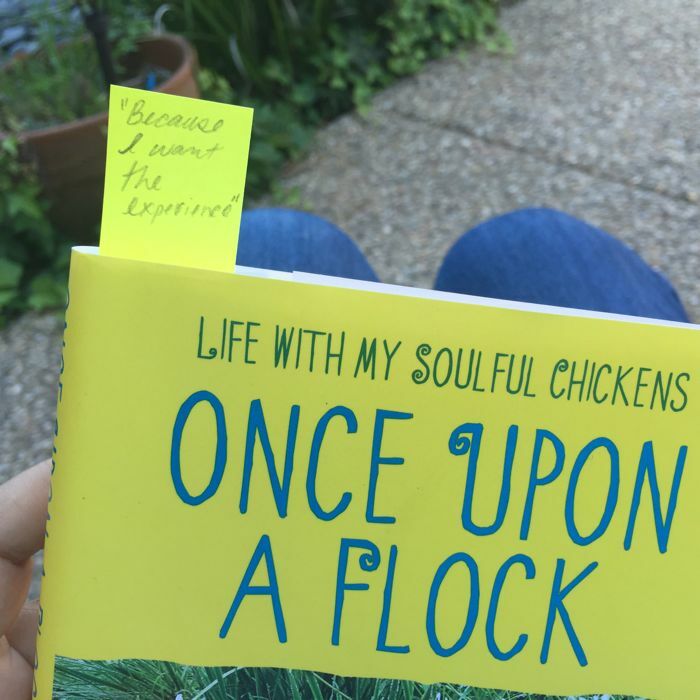 Not since my school days have I felt so compelled to bookmark, tag, Post-it, or take notes in a book, but when I read Lauren's reply to her husband Danny's question, "Why do you want chickens?" I was audibly awestruck (a funny sound.) In all the years I have been wanting, then actually keeping chickens, this very question has been posed to me many, many times, and I have never had an answer that satisfied me. Why do you want chickens?? None of those answers was complete, and I must acknowledge that I have often felt a bit apologetic about this chicken business. Which is why I enjoyed such a wave of relief, of connection, empathy, even self understanding, when I read Lauren Scheuer's words... "Because I want the experience." Isn't it brilliant? I felt a lightness of being, a warm sensation of being alright in the world. It's simple, honest, sincere... both Lauren's answer, and her story. And it's realigned my thinking and perception about life. Why do we read, or cook, or walk, why do we bring home a kitten, or share stories, make new friends, go new places? For the experience, otherwise what is a life for? I really am delighted to be thinking on this whole idea, to be feeling the liberty and gentle wisdom of it. I don't have to be right, there doesn't have to be a perfect time, or an optimal outcome, and I don't have to justify my choices, and let's assume I am within reason, laws, and my budget (close?)... if a chance comes along, if an opportunity is within reach, I can do it, go there, have that, or sing along, because I want the experience. 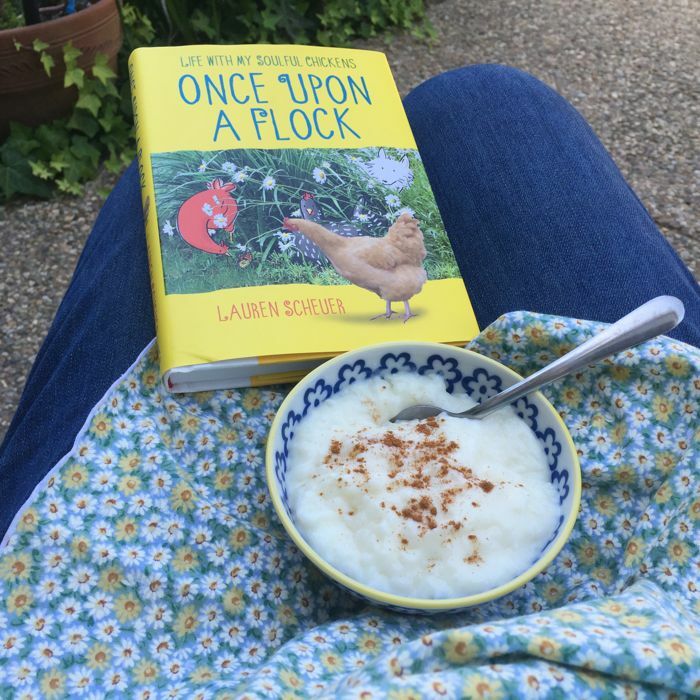 Lauren, I am loving your story. It's well told, honestly expressed, and an inspired treat. I cannot wait to read the rest, but I know I'll be sorry when it's done. Chango. Chango, why are you spying my rice pud? Are you looking for an experience? Wow! What a lovely, heartfelt review! And yes, Lauren's book is a delight! It sounds like a book I would enjoy, too. I just got five new baby chicks. They are supposed to be Araucana and lay the green eggs, but I think one is a Bared Rock, and then I also picked two little golden chicks. Don't know what they are, but they are super friendly and run right to me when I open the cage to feed and water them. I am looking forward to watching them grow and I need to go get this book for sure.